Drive By Wire BMWs with electronic throttle bodies suffer from a throttle delay that robs acceleration potential. The Sprint Booster for 2001 model years and newer improves throttle response and provides a more direct feel, making the car more predictable and enjoyable. When BMW began using the "Drive-by-wire" throttle system in 2001, a lot of people cringed. The Drive-by-wire system uses electronics to replace the mechanical cable throttle of the past. This means the electronics between the accelerator pedal and motorized throttle must interpret what your right foot does, and ultimately decides how the engine will respond. Although advanced in it's technology and engineering, many of us agree that the Drive-by-Wire equipped BMWs feel unresponsive and lack the crisp, sharp throttle response that older BMWs had with a traditional throttle cable. That's where the Sprint Booster comes in. The Sprint Booster is an in-line "plug and play" module, that remaps the Drive-by-Wire throttle curve to be much quicker than stock programming. It removes the "lag" or delay that exists in the stock electronic mapping. The result is sharper, quicker throttle response and immediate power delivery. NEW! The Sprint Booster V3 are now out! We found the difference to be NIGHT AND DAY, and were instantly smitten by the snappier feel the Sprint Booster gave to both a stock BMW as well as on a modified BMW. What's more - the Sprint Booster installs in just a few minutes at the back of the gas pedal. Simply release pedal from the pedal base by unlocking the locking tab, pull the pedal up/foward, unplug the harness, and plug in Sprint Booster. 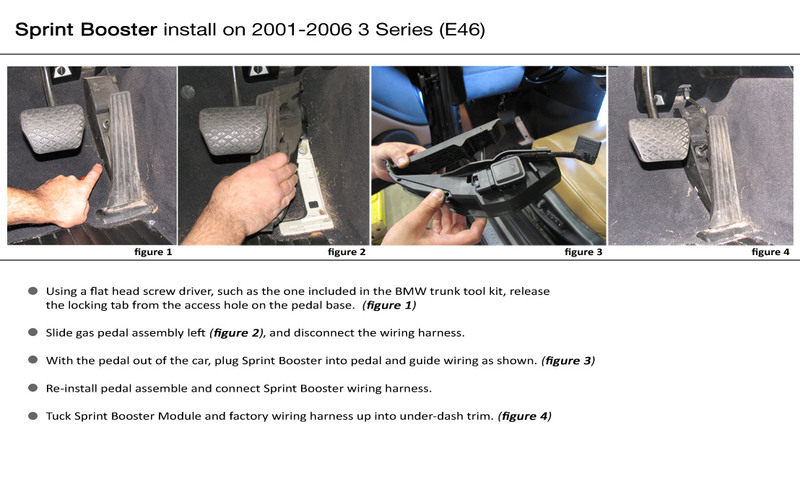 Here's an example of how simple the install is -- installation on an E46 3 series. Full for 3 series installation instructions, click here. How does it work? The Sprint Booster listens to the pedal input signal, and sends an improved signal to the ETC (electronic throttle control) which has been amplified or "boosted", so that the throttle is more responsive throughout the entire rpm range. This product qualifies for FREE FEDEX GROUND shipping within the 48 contiguous United States.